fantastic image, Carin!!!! Coming and going views … followed by a little bit of rolling thunder. My head is spinning! I’m going to comment before reading your comment above, Carin. Rearrview mirror, yes — but then what’s going on up above? How did those motorcycles find their way into the shot? AND — says the driving vigilator — how on earth did you manage to snap a picture right then and there??? So intriguing — and scary — but I presume you survived whatever happened next! Just a fluke, Barbara. There I was driving along, minding my own beeswax, when suddenly a gaggle of bikers [not recreational] pulled out behind me from a side street. With trembling hands I lifted my ever-present camera and pointed at the general vicinity of the rear-view mirror. Voila. This is what I got. 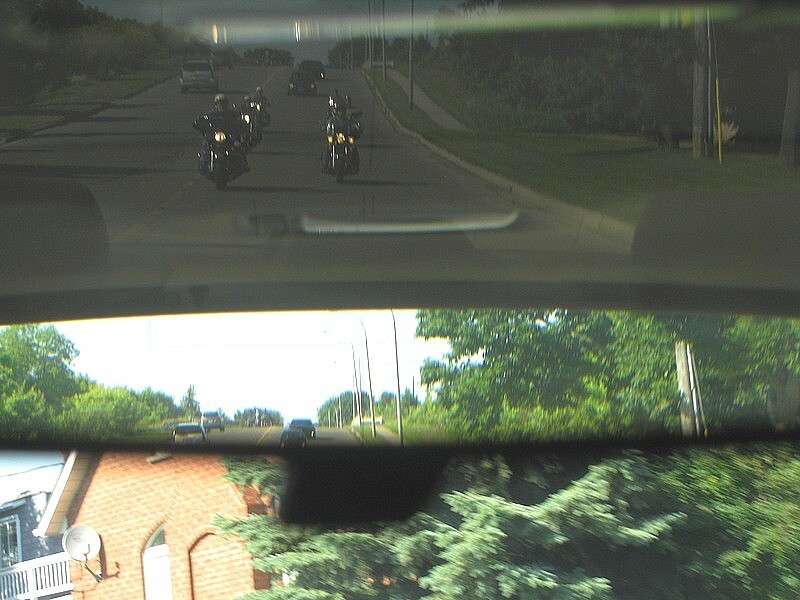 The bikers are behind me, and the middle shot is somehow a duplicate… no idea how that happened… also can’t figure out what the bottom slice is or how I got it. Any houses were neither forward nor back. It was a residential street [all the more startling to see the gaggle] and I was going slow enough to hoist my lens briefly. Eyes fully on the road and one hand firmly at ten to the hour. Still, I do recognize the folly of my ways and am repenting as we speak. Very mysterious! My head is spinning too, trying to figure out the layers. I was on my way to babysit a room full of kids, age 4 to 12 so was slightly delirious myself… Cannot account for the way the image turned out. Hmm, at first I thought it was out the car windshield but then it looks like duct work or something on the interior. Oh, now I see you were delirious -that explains it, or not? Well a truly mysterious shot, even tho delirious! Great once again to share the Magtree eye! Thank you. …And Ms. Howard, I love those shoes.